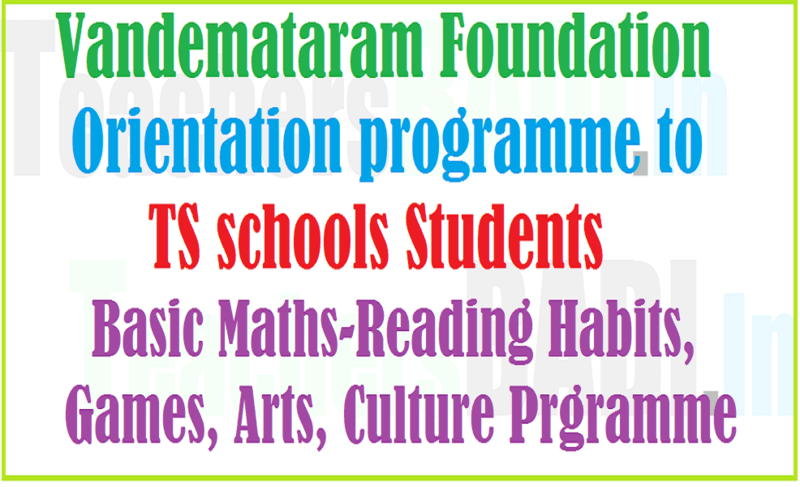 Vandemataram Foundation Orientation programme to TS schools from 30th September: Basic Maths-Reading Habits, Games, Arts, Culture Prgramme to TS Students, Vandemataram Foundation Orientation Programme to TS Schools students, VMF training programme to ts schools children. DSE, SSA PD Telangana, Rc. No.91, dt.28.09.2016: SCERT, Telangana, Hyderabad - Orientation on a programme of improving basic skills of Mathematics, developing reading habits among students and implementation of Games, art and cultural activities (Bala Sabha) in the schools from 30th September to 8th October 2016 at Akshara Vanam, Kalvakurthy, Mahabubnagar District and other places by Vandemataram Foundation- Sending selected children and teachers for the training - Orders issued. Ref: Meeting with office bearers from Vandemataram Foundation, Dt. 23.09.2016. 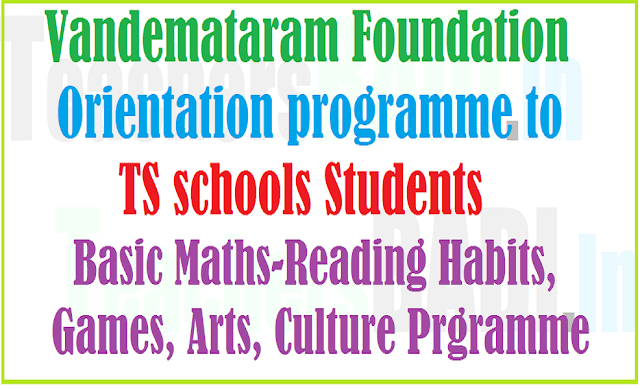 All the DEOs in the State are hereby informed that, the Vandemataram Foundation conducted training on basic skills of Mathematics language and Art & Craft for the children and students of 20 schools per district in the State of Telangana during August and September 2016 at Aksharavanam. Based on the feedback from the Headmasters, teachers, students and supervisory officers it is proposed to conduct training to remaining schools in a phased manner. In this regard it is proposed to conduct a 10-day programme from 30th September to 8th October 2016 at Aksharavanam and other places as given here under. The center wise allocation of districts along with names of the schools and no. of children are enclosed here with. The DEOs are requested to inform to the school Headmasters through Dy.E.Os and MEOs and see that all the children from the schools as per the list must attend the training at the respective venues. The DEOs have to monitor seriously so as to reach all the children to the venue on the 30th Sep. 2016 at 10.00 AM. Following is the involvement of teachers in training at AksharaVanam from each of the 20 schools from each district. • The PETs and PD shall bring the children from their schools to the training center on 301h September 2016 at 10.00 AM. • The Maths teacher from each school shall attend on 81h October 2016 and get back the children to the school. • The travel charges to the students and teachers will be from available school funds to meet the bus charges and will be reimbursed at the training venue. It is a residential training programme. Therefore, all the DEOs in the State are requested to depute teachers and students as above to the training programme. The list of schools and number of children per district is enclosed along with the name of the training center. The POs of Mahabubnagar, Nizamabad, Karimnagar districts are requested to inform the Principals of KGBVs of Veldanda, Mahabubnagar dist., KGBV, Konaraopet, Karimangar dist., KGGV of Almaspur of Karimangar dist to provide KGBV schools as venues to conduct the training programme and facilitate both boarding and lodging facilities. The required amount towards meeting the expenditure for training programme will be released to the concerned POs from the SPD, SSA. In case of venues i.e. Aksharavanam, Kalvakurthy, KGBV, Veldanda of Mahabubnagar district, Nithin Bhavan, Thorrur, Warangal district the Vandemataram Foundation shall take up all boarding & lodging facilities and the required amounts as per the norms will be. released to the POs of Mahabubnagar, Warangal to meet the expenditure as per the norms. In case of training venue at Model School, Sadashiv nagar the Principal shall arrange for boarding and lodging facilities to the students and the required amounts will be released to the Principal. The Principal Model School, Konaraopet is instructed to provide venue to the training. The supply of teaching learning material, story books, Art & Craft material and conduct of programme will be from Vandemataram Foundation in all the centers. The list of concerned Co-ordinators and their mobile numbers have been enclosed and also shown in the above table for further contact and for details. All the centers shall be provided adequate facilities for medical emergencies and POs to deploy ANMs during training programme to all the centers as shown above. Therefore, all the DEOs are directed to inform the concerned Headmasters to send students and teachers as above to the training venues and ensure for their participation. The POs are requested to inform concerned Principals of KGBVs for the programme facilities, including lodging and boarding and also for deputing adequate no. of ANMs to all the training centers to attend medical emergencies. The Principals of Model Schools shall facilitate for conduct of the programme in the Model Schools. The ASPD, SSA and Joint Director, Model School are directed to inform concerned Principals and POs and see for the effective conduct of training programme. Igniting minds, making them leaders :: Little Leaders - Little Teachers Orientation Camp: 1,500 students going through the ‘experience of a lifetime’ at six different 40-day orientation camps. A whopping 1,500 students are going through ‘experience of a lifetime’ at six different 40-day orientation camps, titled ‘Little Leaders, Little Teachers’, an initiative of the Educational Research and Training Centre of the Vandemataram Foundation and the Mahabubnagar district administration.